QB Cam Newton vs. EDGE Trey Flowers – The Panthers’ offensive line has struggled this season with the new pieces at tackle, allowing 26 total pressures in three games this season. The tackles have surrendered 19 of those 26 pressures allowed. 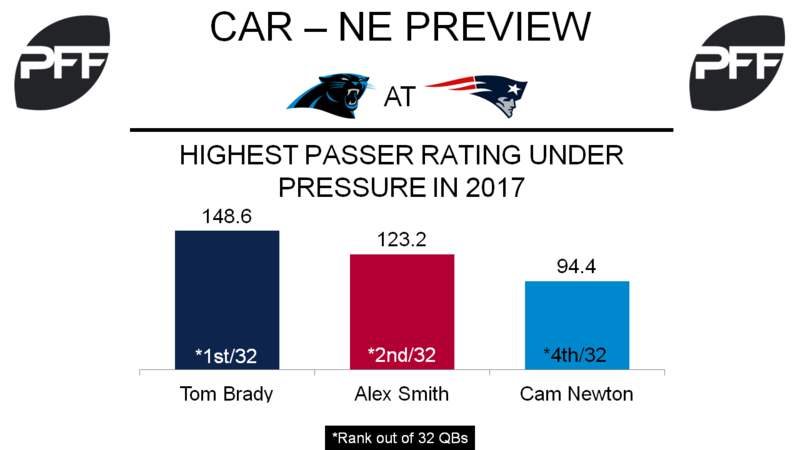 Newton has dealt with the pressure this season better than any year in his career. When under pressure, Newton has had a passer rating of 94.4, which is the fourth-highest by a quarterback in 2017. His passer rating actually increases 32.1 points when facing pressure compared to being kept clean, the highest increase by any quarterback. Flowers is the Patriots’ best pass-rusher with 17 total pressures this season, recording at least one pressure from eight different positions along the defensive front. Meaning that each offensive lineman will have to prepare for him as he tries to break Newton’s early season trend under pressure. HB Christian McCaffrey vs. S Patrick Chung – The electric rookie has shown his versatility early in his career. The Panthers have lined up McCaffrey in 13 different positions on offense this season. His versatility is also evident by 41.9 percent of his touches coming from receptions, the second-highest percentage in the league among running backs with at least 16 touches. McCaffrey’s 80 snaps in route this season are the fifth most by a running back in 2017 and he has yet to drop a pass on 18 catchable passes. Meanwhile Chung is a chess piece in his own right, lining up in 20 different positions this season throughout the defense. He has struggled in coverage though, allowing 1.58 yards per coverage snap, the second-highest among safeties, meaning he could struggle covering a receiving threat like McCaffrey. HB Jonathan Stewart vs. S Devin McCourty – Stewart is more of a traditional running back than McCaffrey, allowing them to become the epitome of a complimentary backfield. The Panthers’ returning workhorse back has 45 carries this season to only three receptions. Stewart has had 75.9 percent of his yardage come after first contact this season. His 123 yards after contact ranks 11th in the league among running backs. McCourty’s 84.9 run defense grade is not only the highest on the Patriots but it is also fifth highest by a safety in the league, and he has only missed one tackle in 194 defensive snaps this season. TE Rob Gronkowski vs. LB Luke Kuechly – Rob Gronkowski has gotten off to an impressive start to the 2017 season. His 87.7 overall grade is the second highest among tight ends, and his 2.48 yards per route run is the best mark among all tight ends with at least 13 targets. Luke Kuechly is the primary linebacker for the Panthers in pass coverage, and the most likely defender on Gronkowski’s short-to-intermediate targets. His 88.2 overall grade is fourth among eligible linebackers, and his 0.72 yards allowed per snap in coverage is tied for 13th among 46 linebackers with at least 46 snaps in coverage. 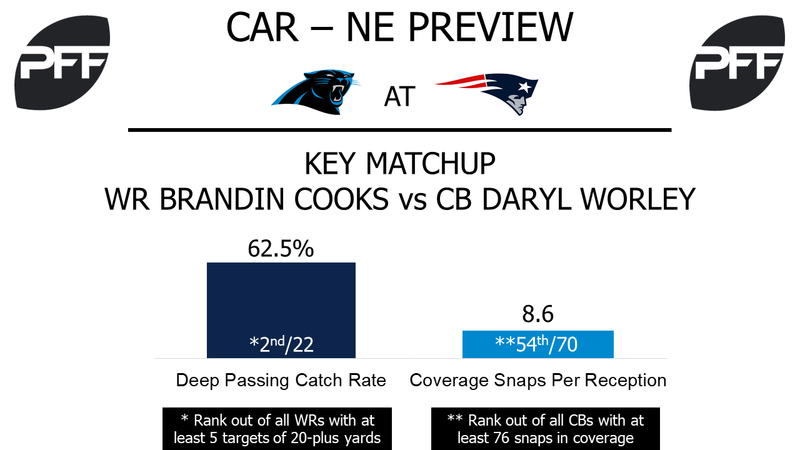 WR Brandin Cooks vs. CB Daryl Worley – Brandin Cooks has lined up on the left side of the offensive formation on 68 percent of his snaps so far this season. His 84.0 overall grade is the eighth highest among eligible wide receivers, and he’s been especially effective on deep passes; his 62.5 catch rate on passes of 20-plus yards is the second highest percentage among wide receivers with at least five deep targets. James Worley’s lined up on the defensive right side for 74 percent of his plays in the first three games, so he’ll most often be the cornerback covering Cooks. He’s allowed a reception for every 8.6 coverage snaps, tied for the 54th lowest mark among 70 cornerbacks with at least 76 snaps in coverage. His 4.64 timed 40 speed is significantly slower than Cooks’ 4.33, making this a matchup the Patriots should take advantage of. HB Mike Gillislee vs. LB Thomas Davis – Mike Gillislee will have to contend with the run-stopping talents of Thomas Davis on Sunday. Gillislee earned a stellar 57.6 elusive rating in 2016 in limited snaps with Buffalo, but through three games in 2017 with the Patriots, his elusive rating stands at 16.2, 40th out of 49 running backs with at least 16 attempts. Davis’ overall play has been excellent this season, as reflected in his 84.7 overall grade. He’s had a run stop on eight percent of his run snaps, the ninth highest percentage among 32 eligible 4-3 outside linebackers.